What kind of connector do you want to convert ExpressCard? Can you upload a photo of your ExpressCard? I will summarize the implemented versions of a schematic drawing, for ease of reference. Heres some pictures. I know its a mess but I checked all connectors many times and also that there is no short between pins. Thank you for the photos. Here are the drawings, you're making version B. At the PCIe slot, PowerGood corresponds to PERST # pin. I already tried the version b. I wanted to try version C but I noticed that my usb board has no pin to "usb gdn #4" so I soldered perst# directly to bottom of the pcb. You are saying that Jeros pcboard would work with gen2 speeds, if I get a good enough USB cable? I think it is yes. Components have come to me, I plan to modify the PCB and order next week. If it arrived, I will test gen1 vs gen2 comparison. We will see the quality of the components (EC module, Ugreen USB cable and the PCB) and if it works well, I will share the project here. I had error 43 but I managed to install compatible drivers. I also needed to change my psu because system was crashing often. only gen 1 speed worked. If I switch to gen 2 in bios the error 43 will appear again. Any advice how to start troubleshooting? I think I'll take you up on this offer! I can't DM yet, being new on the forum, but could you contact me on yahoo, to discuss the details and we don't spam everyone here? Same user name as here. Gen2 signal is sensitive to electromagnetic noise. Your attached photo shows a lot of soldering. Try to use less solder and shorter wires. Or if you can use shorter and better quality usb cables. You think using coaxial cable with common ground in the EC card is a good option? I think the coax cable's core is too big for soldering. I used wires of a telephone cable, but should be good any copper wire. Since the card can saturate the maximum 4Gbps bandwidth of Exp 2, I'm looking to get the best setup in terms of performance, cost, and space used. Looking at the solutions available, the GDC Beast and the P4EC16-N03 pop out. 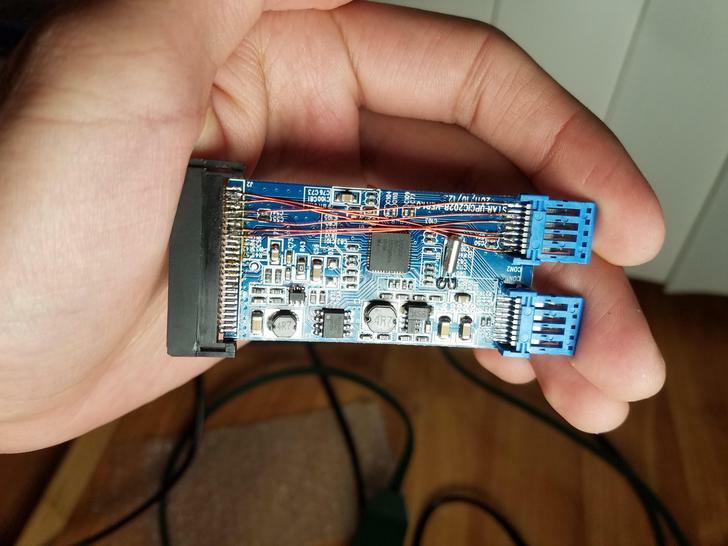 I've read a bunch about the P4EC16, and people seem to be having a lot of trouble with the USB cable not providing gen 2 speeds, and having to solder the express card. On the other hand, the GDC Beast is portrayed as something that more "jank" and unreliable compared to the P4EC16 and it's also more expensive. Has anyone built a Expresscard + P4EC16 machine and gotten gen 2 speeds? Also, is there another solution that avoids soldering? I do have a bunch of PSU cables, but no PSU, so I'm trying to drive the entire thing off a Dell DA-2. i have an HP 2570p and i want to use a Riser 009s/007s which comes with PCIe X1/USB3 (i live in Algeria and we only have these.....the miniPCIe version are not available and we don't have VISA cards to buy from the net ).so how can i make the wire connection from PCIe X1 /USB3.0 to Expresscard ? While this is possible to solder such an adapter yourself, you'd still need a donor board for an Expresscard connector. It is also not a trivial soldering job. Problem 1 - Upon inserting Expresscard into the slot. The laptop simply doesn't boot up. It gets stuck on splash screen with no way to jump into bios. Disabled PCI express power management. So far its a disappointing failure with no workaround I can think of. How did you modify the expresscard? You need to look the way your adapters pci-e slot is wired to the usb cable. You can use a multimeter to check those 9 wires and then match those with the expresscard slot. I made some tests with Radeon R9 270x and I had decent performance on external monitor. It worked at gen 2 speed even with my exposed wiring on the expresscard. Now I bought GTX 760 because I want to use the internal display and Nvidia supports that. However I am unable to get gen 2 to work with this gpu. It worked for few times after I installed RF shield on the expresscard but not very stable and only reaches 200 MiB/s transfer rate in cuda-z monitoring. One time I was lucky and it was little while at 400 Mib /s and fps in furmark almost doubled. I did my best and reworked the wiring but it didn't help and I'm running out of ideas. Even my cable is not too long but I can try to buy a better one, any suggestions? Anyone have an idea where the problem might be ???? I guess what the problem is. The drawing is not clear and the picture from USB may not be readable. I'll improve. Sorry again. CPPE# indicates the presence of the module. If not connected to GND, the notebook thinks that there is no ExpressCard in the notebook. I used this exactly for the delay. I haven't had too much time lately, but I look over. I added a image from USB 3.0 (Type-A) connector pin names. You'll find it in the post where the versions are, I hope this helps. Later I will add this schematic draws for the original main post. It will probably be a stability problem. Unfortunately, when I tested version C, it didn't work with cables. ExpressCard is very sensitive to noise, and if you do not use PCB, stability problems may occur. I recommend version C with PCB only. Unfortunately, I know that "version A" might seem more complicated, but more stable and better if you don't have a PCB. Version "B" is also not recommended with cables, only with PCB. The idea of implementing version B is to have the ExpressCard and VGA's PCIe slots on a single PCB. The PCB for this has not been designed yet. Unfortunately, I can only suggest that you try to set gen1 and set UEFI without CSM. DSDT override is only required if the card is equipped with 2GB or more of VRAM, or if you get "error 12" anyway. Yes, this is version C.
Jero was the first what designed a PCB. @diyman, Is reliable an DIY version of this with a USB3 connector? Version C is hopefully stable (only with custom PCB). Wait a few days, soon my PCB will arrive, then I will write my experiences. I will also try the pcb mod soon. I can post the results and comparison after its finished. I noticed before that the version C is not correct drawing for my adapter. I needed to change receiver and transmitter lanes around. Jeros earlier schematic was correct for me. It might be that there are similar but different adapters with switched wiring on usb? I also had idea that it might be possible to get pcie 4x through M2 NGFF slot but it would require two usb 3.0 cables for all the lanes or maybe some other like hdmi with more wiring. It would need custom M2. adapter and custom pcb for pci-e adapter but they have only few components so it shouldn't be that difficult and all parts can be removed from regular adapter like the pci-e slot and capacitors and molex connector. My other laptop has this slot and I have M2 to usb adapter but its only x1. It has intel gen 7 i5 cpu that should support Gen 3 speeds that might be enough to have decent performance so I dont know how much more performance 4x would allow. The result ~320MB/s in CUDA-Z (tested with 9600GT). Fortunately, the 1m long Male to Male Ugreen cable is perfect. I am currently using Sapphire R7 260X 2GB, which plug & play with the eGPU system. Later I check the PCB design and share it here. I made an automatic shutdown with a relay. The notebook's USB gives power to the relay and the relay turns on the PSU. When the notebook turns off, the relay turns off the PSU. The delayed connection project failed. I discovered that GND should be delayed alongside CPPE#. One image shows the delay circuit and another circuit that converts the push button to toggle button. I designed a secondary USB 3.0 socket. Optionally, it gives + 3.3V (for 3.3V relay - auto power on), WAKE# pin, USB 2.0 Data + and Data connection, and CPUSB # pin to activate USB 2.0. @diyman, With base in this results on cuda-z, is impossible to play? same on external monitor? thx for answer my quests.. This result was on external display. My primary eGPU card is a AMD R7 260X 2GB, so i can't run CUDA-Z. I tested once with the old 9600GT. AIDA 64 GPGPU benchmark not works for me with the 260X. The test is stopped. May vram error. But I now play Watch_Dogs. Possible to play. For anyone who's still trying to to the original mod, I found 30 AWG enameled wire to be much easier to work with. Also, it might be a good idea to preserve the ground plane on this thing, to reduce the number of jumpers needed. I have not gotten it working yet, however like @KasperMarouan, my cpu just slows way down. That should be something good, right? I'll reread the thread in a few. I was hoping you guys can shed some light on my new plan. My original plan of following diymans guide went wrong because when disassembling the esata expresscard i had, i ruined the locking mechanism. I have extra parts of this laptop. A Dell Vostro 3500 and i ripped apart a expresscard socket to find out if i could do something with it. After taking it apart i was thinking maybe i could move the expresscard holder further up and use that as the "front" plug? I was thinking of soldering the original sockets positions pads, to the repostioned "holder" with ethernet wires and glueing it in place. Then i thought of eliminating the PCI-e mini-card by soldering the USB3 mini cable directly to the esata expresscard plug. Would this work better it eliminates the socket or would it be better to just wait 1 month for a expresscard from China? hi, i've been researching this project for a few days and i tought i'd share my "progress" so far. I want to create my own design featuring a USB-C connector for reversablility and durability reasons. the type-c connector features 24 pins, plenty for out 9 pin USB-A connector (the one found on the pci-e adapter). although it may seem sensible to to use this connector there is a seriours compatibility concern. following the usb type-c standard specification pdf i considered the featured "usb-c to standard a 3.1 connection". following jero's schematic for the custom pcb, power GND and GND_DRAIN need to be isolated in order to work and here lies our problem, if a check for continuity with my multimeter on a standard usb-c to usb-a 3.2 i see that pin a1,b1,a12 and b12 (all the GND of the type-c plug) are interconnected, resulting in a dead short across all grounds and connector shielding. if i check for continuity on the adapter itself i can see that GND_DRAIN is connected to shield, while GND (power gnd) is isolated and not interconnected. using a Type-c connector would therefore be unfeasable, due to potential short(depends on the cable manufacturer though). I went ahead with it and i have had some succes but i guess 2Gbps is just not enough bandwith. sigh. Have to find a 2 gen i core laptop. It works tho, and i get around 40 fps in deus ex human revolution at 1440x900 on medium settings. external monitor. had to burn off the isolation. Thats why the 30AWG is burnt. It doesnt seem to make a difference if i connect it to unmodified expresscard board (cuda z no custom) or modified with repostioned socket (cuda z reports). I have an HP Pavilion DV7-3160es with a spare Expresscard slot, my cpu is a 1st gen i5-430M. Would you think a heavy card (like say a RTX 2060) could run on the pcb replaced USB3.0 -> EC adapter just fine? Hey Diyman, I have almost the same laptop as you but I have an issue, that the device manager fails to detect the eGPU. Any clue what is the problem? is it the Bios setup? I'll attach pictures of Bios if required. Note: I connected the PSU at the 24 pin(the greeb-black wire) so it can be switched on.